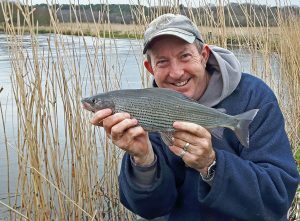 My latest interview is with angling journalist and conservationist, Steve Lockett. I don’t exactly remember, but I was probably around 9 or 10 years-old. 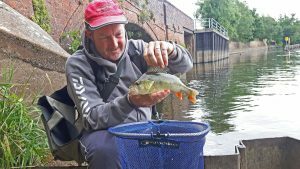 Most likely it would have been a trip to the Ashby De-La-Zouch Canal with my dad, and if we were very lucky, I may have caught a perch. My dad has never really been angler, but his older brother, Mick, was, so it is “in the family”. The few Sunday visits to the canal were a very short-lived treat, mostly about having a few hours with my dad away from two younger brothers. Those few sessions were probably also more important for a chance to pick mushrooms, and to visit his mum on her farm for some free milk. Within a couple of years, I was cycling to the canal and the River Sence (a 40 mile round trip), or walking to the Little Pit in Hinckley during the summer. My childhood friend, Andy Simmons, was a very keen angler and we joined Hinckley AC together. 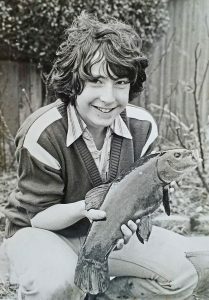 Steve began his print career after catching this tench from the Little Pit and appearing in the Hinckley Times, aged 14. In recent years I have really taken to light lure fishing, but my lifelong love has been float fishing. 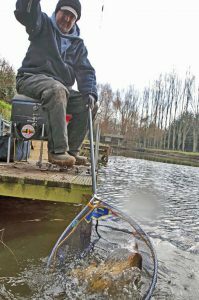 Ideally, fishing a waggler on an open stillwater for quality roach and skimmers, although for the last 20 years, carp have been more important both for match fishing and for tackle testing. I have done plenty of river fishing, and have had some success doing it, but putting a float down a river is probably one of my weakest methods. I don’t really have a single favourite venue. What I would say is that I can’t get enough of fishing small rivers. There is something elemental about being alongside anything from a small stream to a bigger, yet feature-filled river. I have also walked the upper reaches of several rivers without fishing them, most notably the River Severn in the UK, the River Ebro in Spain and the River Cauvery in India. All three are surrounded by dense forest, which gives you the sense that the scenery is probably very similar to how it was when the first humans walked through it, if you ignore the concrete temples at the very start of both the Ebro and the Cauvery! First, I’m not really interested in the size of fish and don’t keep records. It is very rare for me to weigh a fish, which is something that causes a lot of argument and laughter between me and a couple of very close specimen-hunter mates. I also don’t want help to land a fish or take photos, so anything much over 20 lb is too much of a handful. In the UK, I have had a couple of carp that were easily into the twenties. One of them landed after looping my pole rig around a float that was moving through my swim. The biggest carp I have actually weighed was in a pole-only match about 1991/92 that I won with one fish for 17 lb 6 oz. Abroad, I have caught some catfish pushing 20 lb, bear in mind I fish for them on the waggler with carp-style kit. 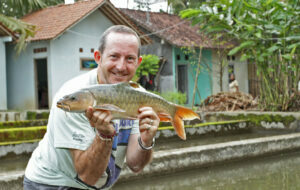 But the largest fish I have caught was a mahseer on the River Cauvery. Again, I don’t know exactly how big it was, but I have weighed lots of them from 20 – 25 lb, and the largest fish was considerably bigger. My guess is it was definitely over 30 lb. As a kid growing up in Leicestershire and fishing matches, Ivan Marks was my hero. I met him once, when I was about 13, and to this day regret never trying to set up an article with him once I became involved with journalism. I was looking at some fisheries up in Leicestershire last summer and bumped into Graham Barry, we spent some time “chewing the fat” about the current state of angling, especially match fishing in the UK. I also shot a feature with the “hemp man”, Pete Jayes a couple of years back. That was a great day out on the Warwickshire Avon, again, plenty of chat about people we all know in common, and so many anglers who I would have loved to fish against when I was still a keen match angler. Brian Gay was a very big influence on my journalism, and through working alongside him I got to know Will Raison and Des Shipp. In pure angling skills terms, I think they are the two best and both helped to shape aspects of my own fishing. But I think I would have plenty to learn from them both about how to moan! I am a very shy, reserved person when out of my comfort zone, and I know there are some very good anglers who are the same. Alan Scotthorne springs to mind immediately as somebody who is right at the top of the tree, but is quite a private person, not at all like a born showman like Ivan, or a solid professional like Bob Nudd. But, if approached in the right way, all those mentioned are only too happy to share information and help those who are in a different league. I have heard many people claiming that top anglers keep secrets, but it is not the case. The issue is usually the angler asking for information goes about it the wrong way. That or they expect too much. It is one thing to ask about methods, baits tactics, quite another to be able to make it work in a match. So many anglers want rewards without being prepared to put in the hard work by ensuring you can cast as accurately as Steve Ringer, which takes thousands of hours on the bank, sometimes not even catching, just honing your skills. Could you tell us a little bit about how you became an angling journalist and also offer any advice for readers who may be thinking of a similar career path? Since my early angling days, reading David Hall’s Coarse Fishing, especially John Bailey’s column, I have enjoyed reading quality writing. Lots of friends and family have been involved with photography, so I had input there as well. Of the two, I think my photography skills have always been second to my writing skills, but, again mainly thanks to Brian Gay, I have worked to improve my photography. In 1997, I picked up a copy of Improve Your Coarse Fishing, and they had printed an advert asking for a correspondent to cover Devon and Cornwall. I had been living in south Devon since 1990. I applied, was giving the job, which was freelance, covering fishery reports, and carried on pushing for jobs in every magazine I could find. Very quickly, I realised that not many people could shoot an article of themselves fishing to the same standard you can shoot another angler. I worked at getting the same kinds of photos and selling articles of myself doing “self-take”. That impacts on your fishing because you have to be very disciplined in setting up your camera with a timer and taking shots over and over again to nail it. I also lost a few cameras along the way when a fish went around the legs of the tripod I had carefully positioned in the margins. In terms of advice for budding journalists, the best I can give is to very carefully study the style of publication you are aiming for. Count how many words go into a particular article, look at how they structure the piece, and when you send in your first submission, make sure it fits the criteria. Even then, be prepared, assuming you are successful and the piece is accepted, for the editor or a senior journalist to ask you for changes to the text or photos, or both. When shooting a piece, try to cover as many angles as possible. For instance, if you take a wide shot of an angler landing a fish, the art desk may want to lay text on top, so they will want some space in the frame and as far as possible, a single-colour like open water or solid foliage. Or, they may want the same shot but with the angler on the left of the frame instead of the right, likewise, they may ask for portrait (upright) framing instead of the usual landscape (sideways). For this first image, I had the camera on its side and took three shots, each time letting the fish swim back out of the net before firing my infra-red remote trigger. For the second image, I let the fish rest in the landing net and changed the camera position to the normal view. I then let the fish swim out again and took another three shots. Angler’s Mail chose the portrait version to print in my article about fishing tiny grub lures on town centre venues. These decisions are partly because of the way the magazine looks, but can also be affected by last minute advertising requirements. The bottom line is: if you have taken photos to cover all those bases, the magazine are more likely to use you again because you make it easier for them to get the mag to the printer. With the internet and Facebook and the like, where anybody can publish stuff (like blogs) for people to read for free, do you think the days are numbered for fishing magazines and newspapers? Sadly, the print media’s days are numbered, but we have been saying this for well over 10 years now. The rise of digital cameras allowed a constant flow of photos to the magazines, which was probably the initial surge of mass free content. When I was in business with Brian and we founded V2V Angling Productions, we quickly learned that the chances to sell even the very best quality DVDs were limited by how much people expected free content. Sadly, after 5 years of trying to argue with people that I would give away my hours of hard work when I could also go into a pub and get a free pint, or take a basket of free shopping from the supermarket, didn’t make any difference to the numbers of people pirating our films and I had to leave the business to earn some money. The clamour for free stuff continues and the models for getting payment for artistic stuff are having to evolve alongside. Sadly, I don’t think the print titles in angling are capable of building new payment models, as they have been too slow to respond, and their place as either artistic or educational trend-setters has been taken long ago by free online providers. You’ve now moved to Spain, are you still involved in angling journalism at all? In the UK, I have only done work for Angler’s Mail in recent years, as well as providing all the photos and reports for the World Pairs in Ireland each year. I come back to the UK about three times a year, shoot some fishery reports in both the Southwest and the Midlands, and shoot a couple of features. I have done features for La Linea in Spain, but not for a few years. In future, I may do some more, as I have always stayed in touch with Paco, the editor, and we should be doing some barbel fishing together in the near future, down in Seville. On a fairly regular basis, I write for an online lifestyle ezine called Living It, through their Indian editor, Sandeep Shetty. 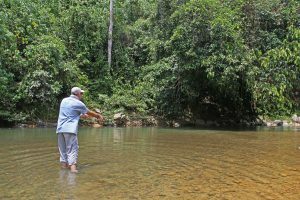 Although the articles are more often about river conservation, I do write about angling from time to time, as it is becoming a very popular sport in India. Sadly, several of the magazines I used to write for are no more. Coarse Fisherman in the UK was one, but I can also add titles in France, Croatia and Malaysia where I had regular articles, and they have now finished. While working as a musician (my first profession) I was lucky enough to visit Costa Rica and would like to go back to explore the rivers there, rod in hand. Argentina and the tropical countries of northern South America are also on my wish-list. The only place I have been in South America is Colombia, while working on a cruise ship. Otherwise, most of my experience is travelling in Asia, and although I have fished and worked in Indonesia, in Java, I do need to go back, but to Sumatra next time. For the same reason, I would also like to visit Laos, and Yunnan province in China. 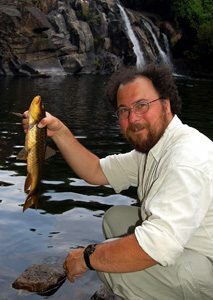 The reason is to track down remote populations of mahseer, but for pleasure, I would be trying to catch Neolissochilus. They are similar to mahseer, both being most like chub, of fish that UK readers would recognise. Trotting a pellet or lump of bread flake on a small river deep inside a forest is certainly my idea of fun. You’re also heavily involved with the Mahseer Trust, can you tell us a bit about how and why you got involved and what sort of work they do? 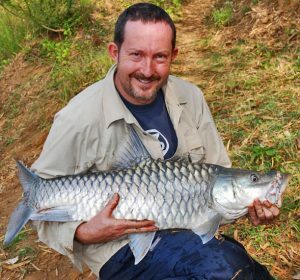 Originally, Mahseer Trust was set up by four anglers from the UK who had been fishing on the River Cauvery and learnt about how mahseer were dying out. Those anglers were Keith Elliott (former journalist, with an angling column in The Independent, amongst many others), Reg Talbot, and Keith and Sandy Armishaw. They called a meeting to get the Trust moving forward at Mark Everard’s house, in 2008. 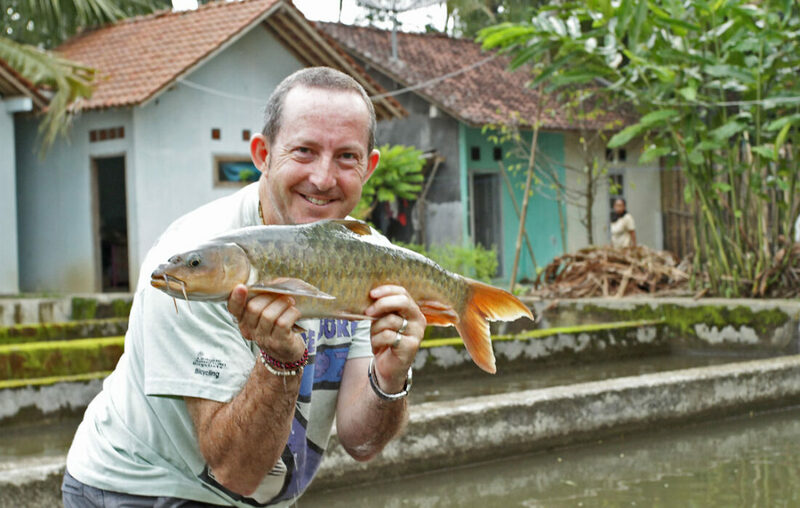 Mark had just been on his first every trip to India, where I had introduced him to fishing for mahseer on the Cauvery, so he asked that I also be invited. The plan was for Mark to be involved as a scientist, but, following the meeting, both Mark and I agreed that it didn’t feel right and we both declined to be involved. Then, in late 2011, the Trust team were approached by Adrian Pinder offering his scientific services. 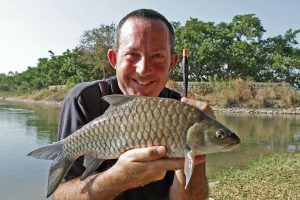 He contacted Mark to ask for advice about the River Cauvery, which was about to be hit by a ban on angling. Mark told Adrian that I probably know more about the river than anyone else he knows, because I have travelled pretty much its entire length, fishing nearly all the way. Once I spoke with Adrian, while I was fishing in Malaysia actually, I could see that he was keen to move the Trust forward in a different way. We had another meeting, at which I said I would be involved as long as we studied all mahseer, in every country, not just India, and that we had to involve scientists from mahseer countries. Luckily, that was where Adrian was ahead of me, and we very soon had a team of collaborators from India and Malaysia, to help run study projects. I have also set an agenda that is becoming common in many conservation fields, that of protecting habitat regardless of the particular plant or animal that you are interested in. Single-species conservation has been the driver for so many conservation programmes, yet it can also be the cause of ecosystem devastation through not understanding the relationship between all parts of a habitat. Although I am not in the anti-otter brigade, on the face of it the introduction of otters into wild populations would be a very obvious and easily understood example of one person or group’s best intentions going very wrong for somebody else’s favourite species. Mass introductions of artificially-bred mahseer into Indian rivers have caused population crashes of local species, and we haven’t even begun to study the impact on other fish species, or other aquatic life. One thing I do know, both from my observations, and those of other anglers on the River Cauvery, is that the freshwater crabs that used to be very common, and a great mahseer bait, are now very difficult to find. 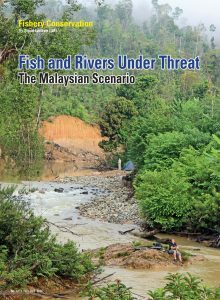 It cannot be coincidence that this has happened since the Fisheries Department continued stocking hundreds of thousands of mahseer from a different river system, and the local species had a disastrous spawning season in 2004/5. 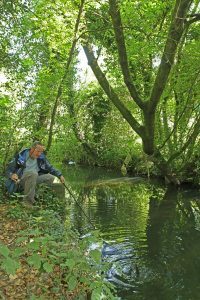 In the UK, a lot of people say commercial fisheries have been the saviour of match fishing, especially with the decline of the rivers but more recently there seems to have been a swing away from carp back towards silver fish matches and rivers, where do you think the future of fishing lies? Looking online and reading the remaining print mags, it will probably be just carp fishing and lure fishing very soon. 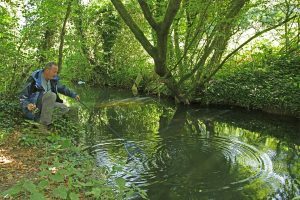 I don’t believe there is a single reason for the decline in coarse match fishing numbers, but the better flow of information has probably lead to many anglers finally realising they cannot compete. 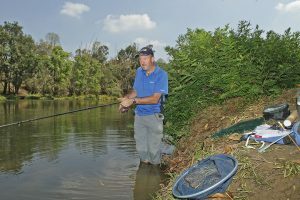 The days of Joe Bloggs drawing the bream hole on the 500 peg river championship and having the best day of his life have long gone. Over the years, I have discussed this with lots of people, but I think I can name the exact time this happened: it was when Fish O Mania was moved off natural venues onto commercials. Prior to that, there was still a chance for an average match angler to get very lucky and make a name for themselves without necessarily being of really top class standard. I don’t fully buy the argument that there are no young match anglers coming through, but I do think that the numbers are declining fast and many of the die-hard match anglers are drifting away or getting too old to carry on. If you look at some of the young anglers around, like Joe Carrass or James Dent, they are frighteningly good. A very under-rated angler is Andy Power, he can do the business on natural venues just as much as he is feared on commercials. Having watched him develop from a teenager, shooting many articles with him, I can only admire his talent and wish I could perform like him while making it look so easy. So given declining numbers and the incredible skills of the younger stars, I think match fishing will probably become fewer 10 peg knock-ups and a handful of “celebrity” big money matches in future. Try to encourage all anglers to take more time to appreciate the environment in which their sport takes place. Without it, the fish suffer, humans suffer, and the sport will be gone. In a similar vein, if you had a time machine is there one moment in fishing you wished you could go back and change? i.e. a dream fish coming off at the net or a decision in a match that’s cost you a title? I can’t really think of any. I am a “glass half full” kind of person, so any mistake I have made is always an opportunity to improve in future. In more general terms, I had a spell in match fishing where I became very serious about it and my results suffered. Once I stepped back and tried to be more relaxed again, my results improved and I knew I had to always appreciate just being on the bank. The best piece of kit is in between your ears. If you cannot think sensibly about fishing, the best tackle and bait will not help you to catch. I get endless requests from anglers starting up in India and Malaysia, and the first question is always “what’s the best bait”, my reply is always “whatever is on the hook when it is in front of a fish’s mouth”. If you cannot find fish, you will not catch, and fish only know if something is edible by putting it inside their mouth. Therefore, first work out where the fish are going to be (or draw them to you by feeding) and then present the bait in a way that appears natural, and they will give you a chance to hook them if your rig can indicate when they mouth the bait. Not a chance. Even the full-time anglers you talk about are not employed just to go fishing, they have to spend crazy amounts of time on promotional work compared to a footballer. Understanding that a paid sponsorship is highly unlikely, first of all, and, secondly, involves travelling all over Europe to give talks at trade shows, and then shooting magazine features which involve fish to-order under stressful conditions, followed by discussing rod tapers in a cold factory or waiting to meet a sales rep in motorway services to discuss line diameters, all mean that angling time very quickly becomes secondary to the main job of working for the sponsor. Almost everybody I have spoken to who has landed their dream of working in angling, whether with a high profile deal, opening a tackle shop, becoming a sales rep, working on a magazine, or running a fishery, soon learns that too much of a good thing can be a bad thing. Enjoy your fishing and don’t take it too seriously. Daytime – tea, preferably strong and from Assam; evening – quality English beer like Bath Ales’ Gem. 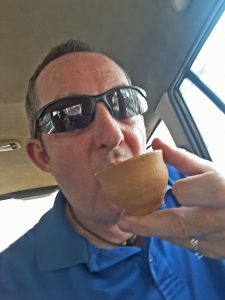 A nice cup of tea – Indian style! Fish curry and rice from south India. Sorry, what’s football? (Laughs) Family have always been Spurs supporters, but for me it’s rugby and cricket. Supporting England in the cricket in India is always a laugh, especially when sat with the Indian season ticket holders. Growing up, Leicester Tigers were my local team but over the last 10 years Exeter Chiefs have taken over. I don’t watch many films, I am more of a reader. The only one that sticks in my mind, and I have watched it more than once, is As Good As It Gets, with Jack Nicholson as the autistic writer. Perhaps because I can relate to that person who is obsessed with doing things right, although it often all goes wrong. I’ve not really watched TV for over a year. Out of choice, I would say any good quality documentary, especially about wildlife. A huge range, from classical to hip-hop and modern electronica with diversions into rock, punk and Latin music. Among my favourites are Ozomatli, definitely my top band and an incredible live act, but also Brian Setzer (Stray Cats), Asian Dub Foundation, The Stranglers, Deep Purple and right back to Mozart and Vivaldi. Lie-in reading a good book. Spanish-style late (usually very big) lunch and then down to the river for the last hour before the sun goes down. With a rod, but that doesn’t mean I will fish.